Delaware: In a research lab in Lewes, marine biologist Nancy M. Targett set out to find out why conch and eel are so attracted tohorseshoe crabs. After three years of research, Targett has an answer: It’s all in the eggs. Download the pdf. Picture this: You’re on a mission to Mars, halfway there from Earth, and you’re not feeling well. Your throat hurts when you swallow, your forehead is hot. Download the pdf. Alabama: You’re on a mission to Mars, halfway there from Earth, and you’re not feeling well. Your throat hurts when you swallow, your forehead is hot. You don’t want to get sick or infect your crewmates. Should you take an antibiotic? If so,which kind? Download the pdf. Delaware Bay: For nearly a decade, conservationists warned that dramatic measures were needed to halt a decline in population of shorebirds that feed on horseshoe crabs, like the robin-sized red knot. On Tuesday, the U.S. Fish & Wildlife Service agreed that populations of the red knot have declined significantly. But the agency stopped short of taking emergency action to list the birds as an endangered species, which conservationists say indicates the bird could be extinct within years. download the pdf. Feds make shorebird a candidate for endangered status instead. Download the pdf. According to the Ecological Research & Development Group (ERDG) of Delaware, whose primary focus is the conservation of the worlds four remaining horseshoe crab species, “an extract of the horseshoe crab’s blood is used by the pharmaceutical and medical device industries to ensure that their products (e.g., intravenous drugs, vaccines, and medical devices) are free of bacterial contamination. No other test works as easily or reliably for this purpose.” Read more. New Jersey: During May and June, thousands of Horseshoe Crabs come ashore along the sandy beaches of the Bayshore region of New Jersey to conducttheir ancient mating ritual. Wait, you are probable thinking of Delaware Bay. Yet, I am actually referring to the northern Bayshore waters ofRaritan Bay and Sandy Hook Bay. The southern shoreline of New Jersey is not the only place that has lots of Horseshoe Crab activity,although you wouldn’t know it as a result of frequent newspaper and magazine articles in past years devoted to Horseshoe Crabs andDelaware Bay. download the pdf. MIDDLE TOWNSHIP – About one out of every four red knot shorebirds decided Stone Harbor and its blue mussels buffet was the place to be this spring. Download the pdf. SLAUGHTER BEACH – One Slaughter Beach waterman is seeing red, and it isn’t on the puffed-up breast of a shorebird. Download the pdf. The light of the full moon helped, but the miner – like headband lights worked even better for the middle schoolers from Virginia who swarmed Prime Hook Beach and waded into the Delaware Bay Saturday night. Download the pdf. The federal fisheries board has rejected a proposal that could have placed a moratorium on all horseshoe crab takes for two years. Download the pdf. DOVER – A late April oil spill on the Delaware Bay defied nearly all negative projections. Download the pdf. The horseshoe crab – helmet-like and ungainly, a relic from the age of dinosaurs – was once harvested by the truckload. Nobody counted, and nobody really cared. Download the pdf. $400,000 over two years, according to state figures. Download the pdf. New Jersey: The Division of Fish and Wildlife (Division) is proposing an amendment to N.J.A.C. 7:25-18.16 in order to provide for a moratorium on the horseshoe crab commercial bait fishery for the calendar years 2006 and 2007. The purpose of the two year moratorium on the harvesting of horseshoe crabs is to improve conditions for the red knot (Calidris canutus rufa), as well as other migratory shorebirds whose survival depends upon an abundant supply of horseshoe crab eggs in Delaware Bay. download the pdf. Horseshoe crab eggs provide vital food for migrating red knots each spring. A House panel yesterday unanimously defeated a bill aimed at saving an imperiled shorebird called the red knot. Download the pdf. The wildlife service denied an emergency request to list the birds as endangered, saying such actions are rare. Download the pdf. Federal officials denied an emergency request by conservation groups to have the western Atlantic subspecies of red knot shorebirds declared an endangered species, according to shorebird advocates who contend the robin-sized birds could enter their final decline by 2010. Download the pdf. Hong Kong: It has swum the waters of the earth for 400 million years, predating mankind and even the dinosaurs, but now the peculiar horseshoe crab is facing its biggest survival challenge. Download the pdf. 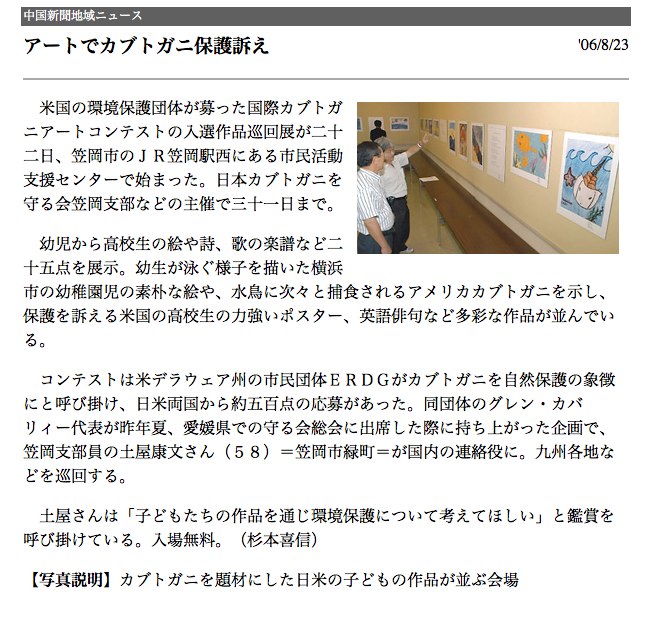 from July 27, 2006 – Download the pdf (in japanese). Delaware: Charlie Auman, a Slaughter Beach waterman, and Bernie’s Conchs, a company that buys and sells horseshoe crabs, have appealed the state’s decision to impose a moratorium. Download the pdf. Delaware: The oft-scorned horseshoe crab is winning human friends. Download the pdf. Delaware: The Delaware Bay encompasses the world’s largest horseshoe crab spawning habitat and foraging area for migrating shorebirds en route to their Arctic breeding grounds. Download the pdf. Delaware: Town officials say Slaughter Beach is at risk without work; U.S. Army Corps of Engineers says other projects have priority. Download the pdf. New Jersey – With New Jersey moving quickly toward two years of full protection for both horseshoe crabs and migrating shorebirds, conservation groups and fishermen are meeting Monday at Richard Stockton College to discuss the possibility of a wider moratorium. Download the pdf.